Blog Quick Quotes: Hoppy Easter with LeeAnn! 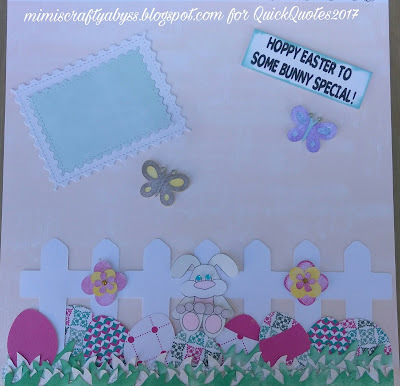 Greetings friends and fellow crafters, LeeAnn here bringing you my March 2017 video and tutorial using the sheets from the Quick Quotes Windsong, Winter Bliss, and Anchors Aweigh paper collection packs along with seven of the PowderPuff Chalking Inks. The first thing I did was to cut the images I wanted using my electronic cutting machine. I used Jade to ink up the Windsong 105 pieces to simulate grass, some I did on the front side, others I did on the back side and alternated them. I put power tape on the back to adhere the pieces to each other. I then placed the fence pieces where I wanted them to be and overlapped them so that they would fit properly on my layout, and found I needed another layer of grass. I then worked on placing the eggs where I would want them to be, They were cut out of the Winter Bliss 101 and 102 papers, which I then alternated them using back and front as well. The little bunny and the sentiment are from Sunsational Stamps and Crafts. I Chalked the edges of the sentiment using Sky Blue. The flowers I used Fuchsia and Buttercup. The butterflies I used Buttercup, Warm Grey, Hydrangea, and Violet. While placing everything for the layout I managed to lose a flower, but you will see in my final photo that I did find that flower, and also decided to add eyes to the bunny, along with glitter dots to the flowers and butterfly Antennae. I also decided to add an insert of AW100 to the inside of the photo frame for a little more color. Once I have a picture of my grandchildren with the Easter Bunny this year, this page will be complete. I hope you have enjoyed my project, please give me a thumbs up and subscribe so you will get notification of when I have another video go live. Thank you so much, and let's get crafting. Please be sure to follow the Quick Quotes Blog and to check out this month's challenge here, my shape is Circles, can you tell?